DENVER--(BUSINESS WIRE)--Sopris Health, an intelligent clinical operations platform that enables providers to focus on human conversations while benefiting from the support of intelligent systems, today launched a new chat-interface documentation solution that delivers a clinic note in 45 seconds or less. Now available on iOS to U.S. physicians and healthcare providers, “Sopris Assistant” proved in clinics to create a time reduction and ease of use unparalleled by other documentation solutions. It also drove workflow efficiencies and significantly lessened the feeling of burnout. 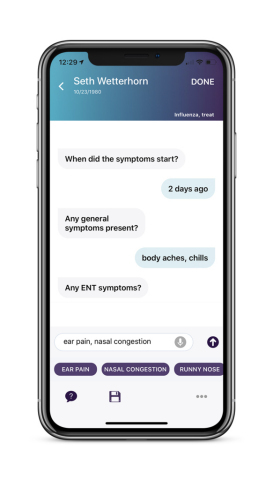 The new Sopris Assistant doubles down on a mobile experience outside the confines of an exam room, asking a few key questions in a unique chat interface. Real-time and fully automated: Sopris Assistant is a fully automated digital assistant for medical documentation. Conversation data alone is insufficient: Sopris Health studied tens of thousands of notes generated by healthcare providers on its AI platform and found in 100 percent of the notes, humans were required to add content to each clinical note after the exam. The patient-provider conversations didn’t contain necessary information to generate complete clinical notes, making ambient listening a useful feature, not a complete product. Voice + Screen: Sopris Health spent time in clinics and specialties across the country, the experience of which demonstrated the combination of voice and select screen taps is optimal for speed and accuracy. Provide actual ROI: Sopris Assistant compresses 5-10 minutes of documentation per visit down to 45 seconds or less – the time it takes to walk from one exam room to the next. Instead of 2 hours of documentation after clinic or pajama time at home, a complete note is submitted by the provider to the EHR before stepping foot in the next exam room – with only a positive impact to patient experience, patient panel and workflow. Experience with the app is only a portion of the overall relationship. For more information on the new Sopris Assistant or the company overall, visit www.SoprisHealth.com. Denver-based Sopris Health is an intelligent clinical operations platform featuring a pioneering “Sopris Assistant” that reduces providers’ administrative burden, creates more time for patients, and relatedly, decreases the level of physician burnout. Unveiled in May 2018, Sopris Health has the dual goals of eliminating physician documentation and automating clinical operations to slash healthcare costs and increase access. Its patent-pending machine learning technology dramatically reduces physician data entry by listening to the physician speak with patients and automatically writing visit notes. This initial product offering is the company’s first step in building the industry’s first intelligent clinical operations platform. For more information on Sopris Health, please visit SoprisHealth.com or @SoprisHealth on Facebook, Twitter and LinkedIn.